Oracle Fusion Middleware is the application infrastructure. It enables enterprises to create and run agile, intelligent business applications while maximizing IT efficiency through full utilization of modern hardware and software architectures. 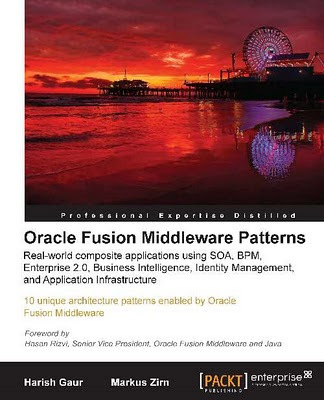 I mention a book titles Oracle Fusion Middleware Patterns written by Leading IT Professionals (Harish Gaur, Markus Zirn, Srikant Subramaniam, Nam Doan-Huy , YiHong Xu , Narshimha Rao Kondapaka, Melody Wood, Matjaz B. Juric, Ross Sharman, Juliana Button, Matt Miller, Mark Simpson, Kiran Dattani, Milind Pandit, Nikhilesh Chitnis, Sandeep Banerjie, Mark Farabaugh, Sri Ayyeppen, John Chung, Mike Blackmore, Hamza Jahangir, Basheer Khan, Rex Thexton, Nishidhdha Shah). This book is written about ten real-world case studies - agile applications using SOA, BPM, Enterprise 2.0, Business Intelligence, Identity Management, and Application Infrastructure. This book shows how to design and develop business processes efficiently. This book has 10 chapters in 3 sections: Process Improvement, Business Visibility and Collaboration and Security. If you are responsible for planning, designing, providing, and operating software solutions, you have to read this book, this book can help you for ideas and solutions.